This was something I said yesterday. 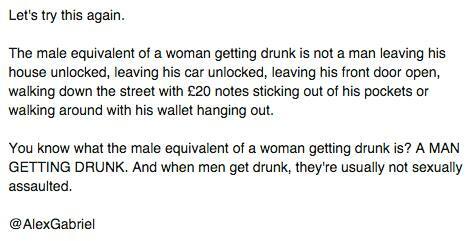 The male equivalent of a woman getting drunk is not a man leaving his house unlocked, leaving his car unlocked, leaving his front door open, walking down the street with £20 notes sticking out of his pockets or walking around with his wallet hanging out. You know what the male equivalent of a woman getting drunk is? A man getting drunk. And when men get drunk, they’re usually not sexually assaulted. 84 Facebook likes, 22 shares, 13,965 views at Imgur and the top post at r/feminism with 436 points: the numbers say the Internet liked it.